You can filter your resource list by tags to quickly organize and find the information that is relevant to you. By tagging resources, you will also be able to search by the given tag for those resources within the global header on any page within the platform. Resource List: You can add and remove tags from a resource by hovering over the tags column (which provokes an Add tags option) or by clicking on the actions on the resource and choosing Edit tags. You can add multiple tags within the tag dialog box that appears. Just remember to click Save so that the changes get applied. Provisioning pages: You have the ability to add tags when you create most resources. So, as the resource gets created, so do the tags that help you manage it. Resource Detail pages: From the Resource Detail page, you can add and remove tags from the resource. Manage Tags page: From the Manage Tags page, you can view all the tags that are attached to your account, including the ones that are attached to classic infrastructure resources. The special addition to this page is that you can delete tags if they aren’t attached to any resources. 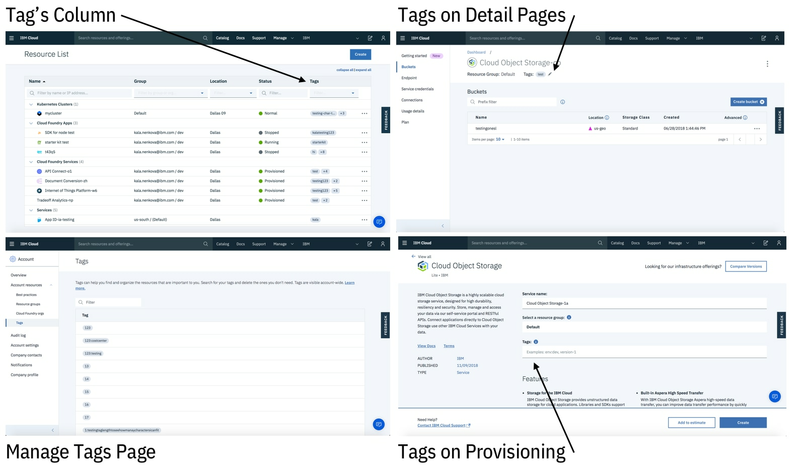 We are beyond thrilled to bring the tagging ability to the IBM Cloud platform. This is the first release of tagging and is setting the groundwork for the future of platform advances.